Summary: Catwoman is injured while leaping off Selkirk’s helicopter. Batman jumps off to save her, while the helicopter crashes into the top of a bridge. Jean-Paul confronts Batman once again, but accidentally sets himself on fire when his flame weapon touches leaking helicopter fuel. After he falls into the river, Robin and Nightwing unsuccessfully search for him. Batman and Catwoman rescue Selkirk and his men. To spite Catwoman, Selkirk throws the neural enabler into the river. Later, Batman hacks his way into the Batmobile, unaware that Jean-Paul booby-trapped it. Jean-Paul reemerges, boasting that now there is only one Batman. Irrelevant Continuity: Gordon is in his office when he’s informed of the fire and explosions at Selkirk’s penthouse. This contradicts Batman #510, which had Gordon getting berated by Mayor Krol when the news comes in. “Huh?” Moment: The blue portions of Jean-Paul’s armor turn red after he’s set on fire. It remains that color until the end of the storyline. Review: More of the same, only more time is killed by giving Batman a fake death scene. The next chapter plays the concept straight during the opening pages, even though I doubt anyone fell for the bait. (The solicitations for the finale in Legends of the Dark Knight #63 had been out for months at this point, so everyone knew that Bruce and Azrael were having their big fight at the end of this month.) 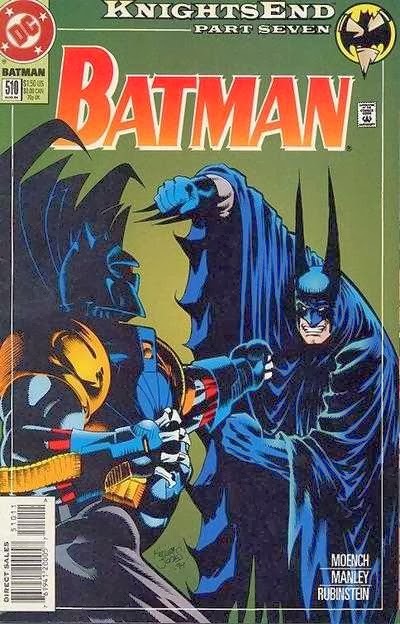 Looking back, I’m kind of surprised DC didn’t go for a serious attempt at killing off Bruce at some point in this event. After building up the drama of Bruce picking the wrong replacement, what happens if Bruce dies before he can rectify his mistake? I could see the creators getting a few months of material out of the concept. (Perhaps the “Death of Superman” event automatically ruled out any attempt to seriously sell Bruce’s death, though.) Regardless, we’re marking more time with repetitive action scenes and a cliffhanger that fools no one. I understand that Alan Grant was bored out of his mind having to work on this material, but I wish he could’ve found some way to break up the monotony. Summary: Jean-Paul refuses to surrender and attacks Batman. Meanwhile, Selkirk’s men target Catwoman, Nightwing, and Robin. The battle sets Selkirk’s penthouse on fire. Eventually, one of Selkirk’s guards uses a helicopter to shoot at the heroes from above. While trying to control Jean-Paul’s grapple, Batman inadvertently causes it to latch on to the helicopter. They swing above the city, as Catwoman jumps onboard the helicopter, demanding Selkirk give her the neural enabler. Review: Following the previous chapter’s cliffhanger, you might think this issue would be the climactic battle between Bruce and Jean-Paul. Surely this storyline couldn’t drag on much longer, could it? Now that Bruce has regained his confidence as Batman and Jean-Paul has been exposed as a loon, there aren’t a lot of places left to go, so it’s best to draw things to a close, right? 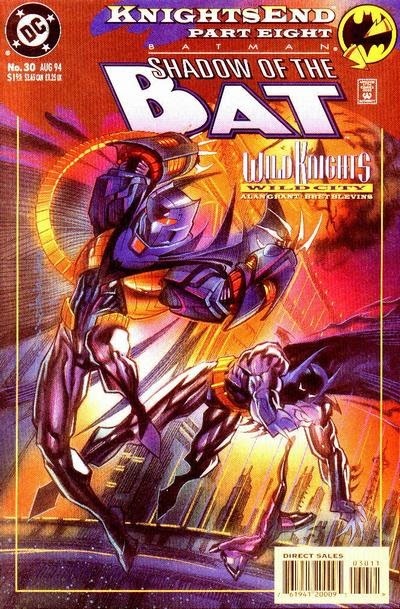 Unfortunately, Batman was released as the first Bat-title of the month. That means the crossover has to continue to drag on until the last Batman title of the month is released, and that’s Legends of the Dark Knight (not counting the two epilogue chapters in Robin and Catwoman.) Instead of a conclusion, the creators have to kill time with some explosions and chase scenes; four issues worth, in fact. In fairness, there is a decent amount of Batman vs. Fake Batman action this issue, which is what the readers have been anticipating for months, but it’s intercut with numerous pages of Robin and Nightwing fighting generic goons, things blowing up, and Catwoman chasing after that nebulous plot device. The flagrant amount of filler is hard to forgive, and you’re just left tolerating these chapters while waiting for the true climax to begin. Summary: While Bruce regains his confidence as Batman, Catwoman searches Selkirk’s property for the cybernetic enabler. Jean-Paul arrives, looking to force Selkirk into revealing LeHah’s location. After making her way through numerous guards, Catwoman reaches Selkirk. She’s quickly cast aside by an enraged Jean-Paul. 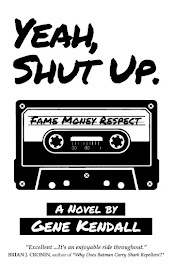 Suddenly, Jean-Paul notices one of Selkirk’s associates and blames him for his father’s murder. At that moment, Batman arrives with Robin and Nightwing. Catwoman is searching for the cybernetic enabler on behalf of Brendan O’Boyle, who I believe is the paralyzed member of her supporting cast. Total N00B: Selkirk, LeHah, the cybernetic enabler, Brendan O’Boyle, the true murderer of Jean-Paul’s father…none of these characters or concepts are actually explained in the issue. Production Note: The name “Parks” is listed in the inker’s slot on the cover credits, but the inking this issue is actually credited to Rick Burchett. Review: The opening of this issue is quite nice, paying off six issues worth of set-up and finally allowing Bruce to bravely leap off Gotham Tower as Batman. The double-page spread of the Gotham skyline might ordinarily seem gratuitous, but it works in the context of the overall storyline. Plus, it’s lovingly rendered by Jim Balent and Rick Burchett, who’s a fantastic inker and probably the best artist to work on the Batman Adventures series. 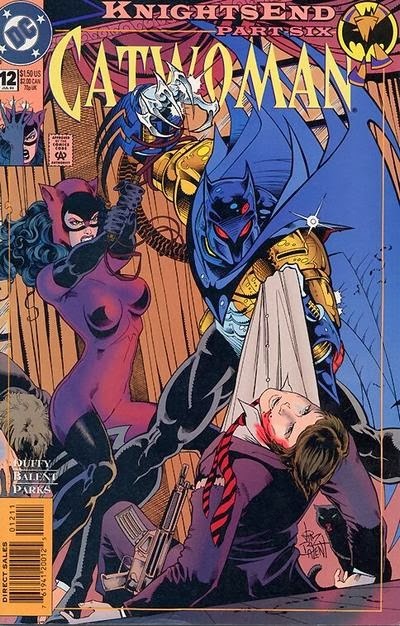 That scene has nothing to do with Catwoman, though, who first appears in the issue torturing a generic thug with a gigantic ‘90s cybernetic arm she’s somehow acquired. I’m sure that regular readers of her title could actually appreciate the context of her adventure this issue, but all I know is that she needs a macguffin for a character whose name I vaguely remember. And then Jean-Paul shows up, acting just as crazy-yet-boring as usual. He finally meets Selkirk, another vaguely defined character that’s never developed in any of these reprinted stories, only to learn that his father really is dead. That’s okay, because he instantly recognizes Selkirk’s meek assistant as his father’s real killer after all (But didn’t he believe his father alive up until the previous panel? ), so now he wants to kill this guy, who we also know nothing about. This is beyond annoying by now. At this point, I can’t even tell if the reprint collection is skipping important chapters again, or if these issues were always kind of a mess. Summary: Xavier, still recuperating from his battle with the Shadow King, attempts to salvage what is left of Legion’s mind. Eventually, Marvel Girl convinces him that he’s seeing his own subconscious doubts reflected at him, and that Legion is gone. As the other members of X-Factor join her in the Astral Plane, Xavier relents and accepts that he must now guide the X-Men once again. Meanwhile, Wolverine gives Jubilee news she doesn’t want to hear, Mystique and Rogue reunite, and Val Cooper proposes Polaris join the new incarnation of Freedom Force. Mystique reveals that Val Cooper actually shot herself and grazed her temple earlier in Uncanny X-Men #266. It was Val’s body that was placed in the ambulance during the news report Rogue saw, as Nick Fury had already stepped in and placed Mystique undercover as Val. The implication this issue is that Jubilee has been thrown out of the X-Men. That seemed to be the idea, as she didn’t appear again until X-Men #4 in early 1992, but I don’t know of any story that officially explained her absence during this period. A shattered photo of Xavier on page nine places broken glass around his left eye, making him resemble Cable. I’m guessing this was a red herring thrown out as a joke, since I don’t recall any fan speculation that Cable and Xavier were the same person. Approved By The Comics Code Authority: Polaris’ costume is pretty racy by the standards of the day, and there’s an extended sequence dedicated to Guido tricking her into thrusting her hips in front of him. I Love the '90s: Mystique jokes that she’s having a “Kodak Moment” with Rogue. Review: Peter David makes his debut as writer, bridging the gap between the original X-Factor and the first of many mutations we’ll see over the years. Kirk Jarvinen is the fill-in artist, and even though he’s given mostly conversation scenes to draw during the issue, he still makes an impressive standing. (I loved his interpretation of Archangel as a kid.) Jarvinen’s fairly subdued and not particularly cartoony at this stage, but he is very skilled at drawing facial expressions and laying out “quiet” pages that don’t feature any action. I’m surprised he didn’t do more work for the X-office during this period; the various books always needed a fill-in, and he’s clearly superior to almost every guest penciler to ever show up in Excalibur. The story begins with Xavier searching Legion’s mind, desperate for any clue that his personality remains. By the second page, Xavier’s already given Legion more thought than he will in a few years after Legion dies in the aftermath of the “Age of Apocalypse.” The books by that point were too scattered to even acknowledge the loss, but thankfully the franchise isn’t quite off the rails in 1991. The visual clues that add up during the issue, paid off at the end when Jean Grey explains that Xavier’s only seen his own subconscious reflected back at him, are obvious in retrospect but not so obvious they ruin the reveal. Xavier’s realization that Legion is gone is emotional without going off into any histrionics, which is a welcome break. “Quiet resolve” seems to fit Xavier’s character better, anyway. 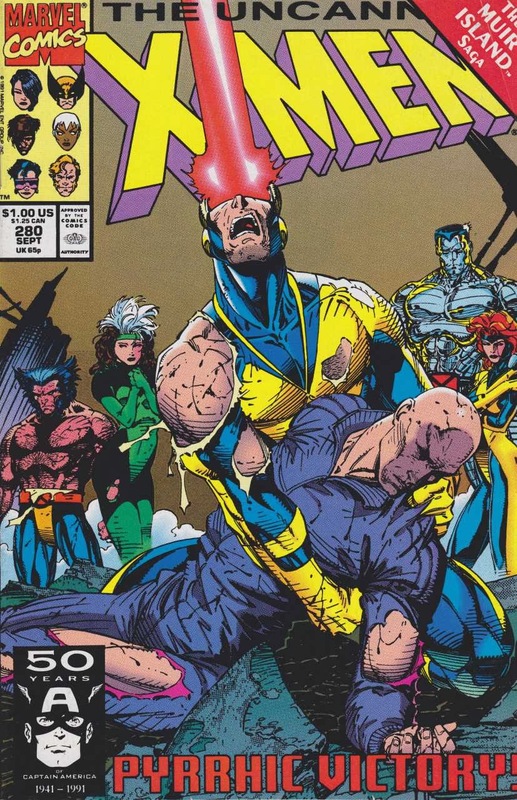 Quick scenes with the gathered mutants appear throughout the issue. Most of the cutaways are used for jokes, but David restrains himself and gives Mystique and Rogue a nice moment. There's an idea repeated throughout the issue of the "center" that cannot hold, i. e. the X-Men without Xavier. There seems to be an automatic assumption that everyone just wants to reunite and live with daddy Xavier again, but there's not much of an effort to actually dramatize why anyone feels that way. If the post-Claremont issues did a better job of showing what Xavier means to the united X-teams, this could be forgivable, but the stories just expected you to accept that all of these adults were perfectly okay going backwards in their lives. David does convey that the various characters, even if they are joking around a bit, do care about Xavier. I just don't see anything that justifies the major shift in status quo the crossover brought us. Summary: Xavier arrives on the remains of Muir Island to discover Marvel Girl has telekinetically protected her teammates from Legion’s explosion. The possessed Legion attempts to kill Xavier, but is chased away by Storm. The heroes split in two -- one group will sever Shadow King’s link to the physical realm and the other will protect Xavier as he fights Shadow King in the Astral Plane. During Xavier’s battle in the Astral Plane, Shadow King shatters Xavier’s back, crippling him. Meanwhile, Forge forces Psylocke to use her psychic knife on Polaris, which breaks Shadow King’s connection to the physical realm. Shadow King disappears, but Legion is left in a coma. According to Xavier, there “isn't much left of Muir Island." Not that any giant explosion has ever had a real impact on Muir Island. Colossus has suddenly arrived on Muir Island in-between issues. Rogue is also wearing a different outfit once again, as she’s back to her tattered clothing from UXM #274 (!). Xavier arrives with two SHIELD psi-operatives, DeMarco and Heacock. They’re killed by the possessed Legion. Review: Considering the behind-the-scenes chaos that was going on at the time, this is a better conclusion than I would’ve expected. The story does get dragged down by more repetitive scenes of the heroes fighting brainwashed heroes (including another uninspired Wolverine vs. Gambit rematch), but that isn’t as large a part of the issue as I remembered. In reality, Nicieza does a credible job bringing everything to a close, keeping track of most of the massive cast while also leaving enough room for Xavier to be the star of the issue. His first-person narration isn’t quite a match for what Claremont was able to accomplish in the previous issue, but the sentiment feels genuine and the scripting is true to Xavier’s character. Nicieza’s strongest moment is when he introduces Xavier’s fear that Legion legitimately enjoys being under the Shadow King’s thrall, and that it might just be Shadow King who’s cured Legion of his schizophrenia. That’s the kind of character work that’s usually forgotten in these densely packed crossovers, and it’s a relief to see such a Claremont-esque idea show up so soon after his departure. What doesn’t work about the issue isn’t too hard to guess. There are too many characters, many aren’t properly introduced, and the conclusion to this giant battle that’s been teased for literally years occurs over the course of a few panels. Apparently, all that was needed for the Shadow King to fall was Psylocke to stab Polaris with her psychic knife -- which means Psylocke was so weak as a telepath that she couldn’t fight off the Shadow King’s influence, but did possess enough power to ultimately defeat him. Okay, then. The most irritating aspect of the issue would be the crippling yet again of Professor Xavier, which is such an obvious play to nostalgia that it’s hard not to roll your eyes. This is an early sign of the Bob Harras “Back to Basics” approach, which sees nostalgia trump even rudimentary plot development. There’s no great story following Xavier’s injury -- he just goes back to living in a chair (albeit in a space-age one designed by Jim Lee.) There’s no compelling reason for the X-Men and X-Factor to rebuild the school and live together again -- it’s not as if they show even the slightest interest in treating it as a school for the next few years. There was never much of a reason for the fully-grown Peter Parker to suddenly act like a teenager again in the late ‘90s either; but hey, those old stories are classics, which means they must be milked for all eternity. There is a time for “Back to Basics,” as evidenced by the late ‘90s revamps of books like The Avengers and Captain America, but there has to be more to the concept than simple nostalgia. Summary: Professor Xavier contacts X-Factor through Val Cooper, and soon they join him in a submarine manned by an international task force. 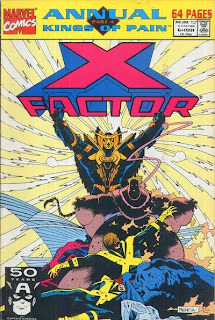 While X-Factor devises a way to reach Muir Island, Forge manages to free Rogue and Banshee of the Shadow King’s control. After X-Factor invades the island and defeats a group of Shadow King-possessed mutants, FBI inspector Jacob Reisz reveals himself as the Shadow King onboard the submarine. Mystique drops her disguise as Val Cooper and shoots Reisz. On Muir Island, the united mutants discover Polaris is being used as the nexus between the physical word and the Astral Plane. Shadow King possesses Legion and suddenly triggers an explosion. Rogue is now wearing her third outfit of the storyline. This time, she’s wearing her standard uniform from the late ‘80s. More wonky continuity -- Colossus disappears this issue, as he’s with Xavier in Washington DC, but not onboard the submarine or with X-Factor when they reach Muir Island. Marvel Girl’s telepathic powers have fully returned in-between issues. Previous issues hinted that they might return, but the confirmation is treated as an already accepted fact. Review: Okay, I’ll give Fabian Nicieza credit. His second chapter of the crossover is much, much stronger than his first. 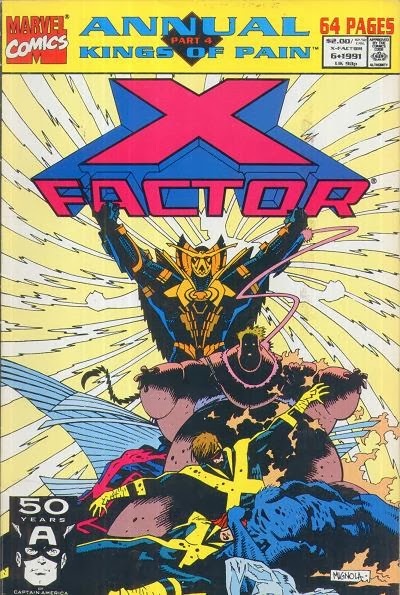 The scripting is noticeably better, as Nicieza shows he has a handle on the X-Factor cast, giving us brief glimpses into their personalities and the dynamics of their relationships. He also addresses the issue of Nathan’s disappearance as well as could be expected, and does a decent job handling the team’s quickie reunion with Xavier. There’s obviously not a lot of room for these scenes, as The Plot must be fed, but he accomplishes what he needs to do without making the conversations seem unnecessarily rushed. Regarding the main plot, thankfully we’re not forced to endure too many pages of heroes vs. brainwashed heroes on Muir Island. The scenes alternating between the “free” heroes on the island and Xavier’s task force plotting their next moves are much more interesting to read. Plus, there’s Jacob Reisz finally being exposed as the Shadow King, and the revelation that Mystique didn’t commit suicide a year earlier in Uncanny X-Men, which are great moments for fans who have stuck through this storyline from the beginning. This is also Whilce Portacio’s best issue so far, as he keeps the ugly faces to a minimum and is able to alternate between the conversation scenes and the action scenes (packed with numerous characters) quite well. Summary: Xavier and Stevie try to escape Colossus in the mansion’s underground complex. Inside the Danger Room, Xavier sets a trap. As Colossus continues to resist, Xavier realizes that the only way to break the Shadow King’s hold is to reach into Colossus’ mind and revive his memories of the X-Men. On Muir Island, Forge attempts to place a neural inhibitor on the X-Men in order to block the Shadow King’s influence. When Rogue attacks, he’s forced to fight back. 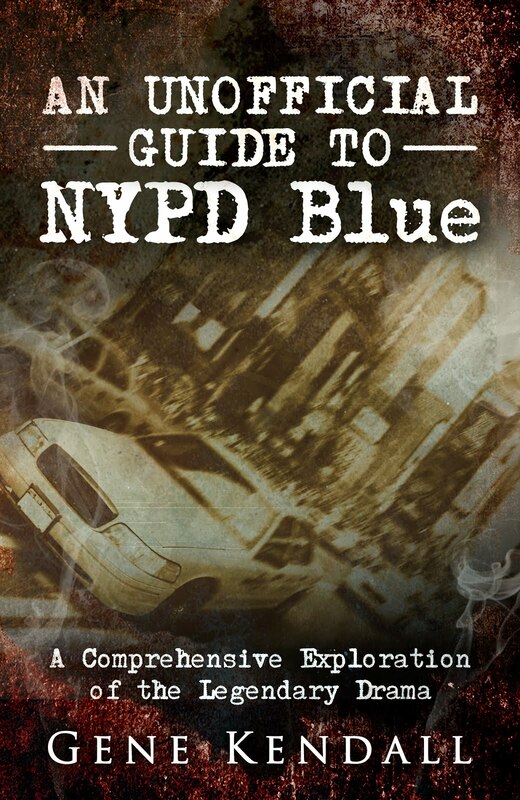 In New York, Xavier stops a Shadow King-possessed mob from killing a child. He then proclaims that he must call on X-Factor for help. Colossus, at this point in continuity, was living as artist Peter Nichols after having his memory erased by the Siege Perilous. In-between chapters of the story, the X-Men on Muir Island have regained consciousness and begun fighting each other. Rogue is also wearing a new costume that’s appeared with no explanation. Wolverine warns Gambit not to throw any more of his "psyche-charged knives" at him, as Gambit’s knives make perhaps their final appearance. (Although the art is so unclear, you could just as easily say that Gambit threw playing cards at Wolverine.) This is also the only time Gambit’s powers are referred to as "psyche-charged,” which I can only assume was a mistake made by Nicieza, who had never written the character before. Let’s not dwell on the negative, though. The first half is a dramatic chase sequence, with Claremont doing a fine job scripting Xavier’s first-person narration, reminding me of the work done to save his final issue of X-Factor. Having Xavier revive Colossus’ memories of the X-Men is a bit of a copout, an editorial necessity that has to be executed before he rejoins the team, but Claremont’s script actually makes you feel for both Xavier and Colossus during the moment. (As Xavier points out, he’s effectively ending the only peace Colossus has known in his adult life.) And Andy Kubert, making his debut as a fill-in artist, does a decent job of following the Jim Lee style without turning into a copycat. You can see some early examples of his aversion to drawing feet, but overall, Kubert is able to emphasize just how scary Colossus could actually be and add some excitement that was missing from the previous issue. 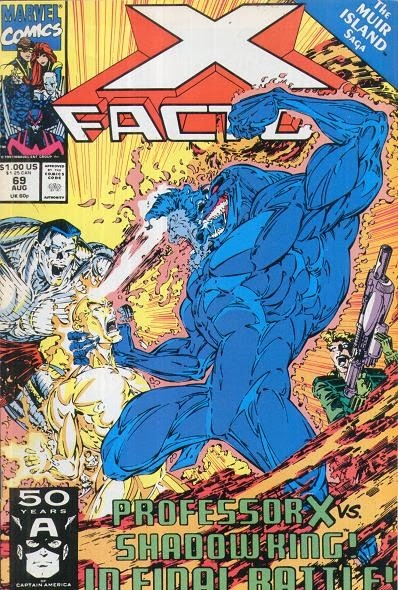 With the help of Scott Williams’ inks, he also keeps the cast “on-model,” even giving Stevie Hunter that unique look that didn’t exist until Jim Lee got his hands on her. Summary: Professor Xavier hijacks Excalibur’s Blackbird from WHO’s headquarters. He travels to America to use Cerebro, while the X-Men investigate Muir Island. The team is soon attacked by the occupants of the island, who are now under the Shadow King’s control. In America, Xavier encounters Stevie Hunter, who is being chased by Colossus. Shadow King reveals himself, boasting that Colossus is now his. Since their previous appearances, Rogue and Guido have arrived on Muir Island. Shadow King is apparently using his powers, combined with Legion’s, to draw mutants to the island. Rogue is surprised to discover just how intense the mutants train in “The Arena,” Moira MacTaggert’s new replacement for the Danger Room. We’re told that Excalibur is missing at this time, but no footnotes point to any Excalibur issues that explain why. Xavier speculates that the worldwide psychic static he senses is caused by the Shadow King, although this should be beyond his abilities. Later, in a chapter not written by Claremont, we’ll discover Polaris is the cause. Review: And this begins “The Muir Island Saga,” the crossover that will soon mark Chris Claremont’s departure from Uncanny X-Men. In retrospect, probably the only significance of the storyline lies in the behind-the-scenes drama. 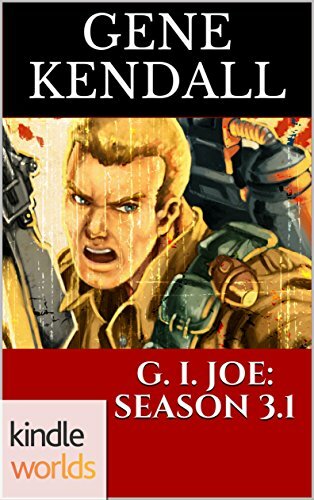 “The Muir Island Saga” does have its moments, but too much of the story consists of heroes fighting brainwashed heroes. 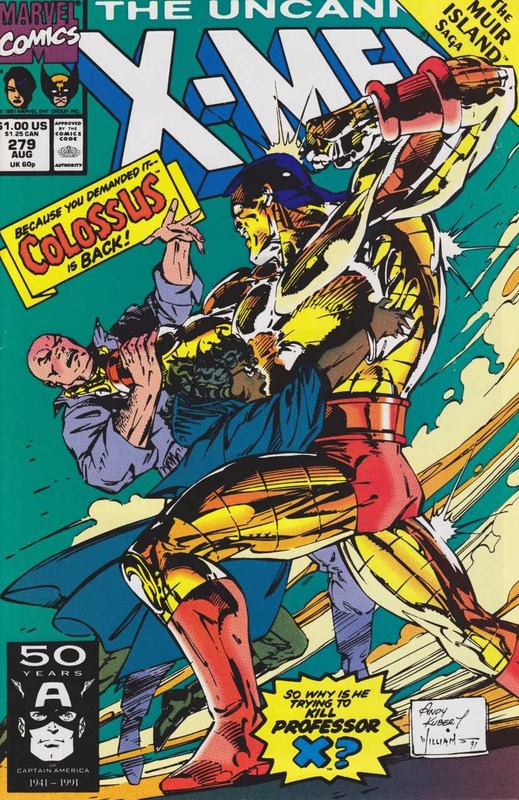 As a reader at the time, it was kind of exciting to see this long-running Shadow King subplot paid off, and to have Rogue and Colossus reunited with the team, but I can definitely recall being ready for the crossover to just end at a certain point. The first chapter reunites Chris Claremont with Paul Smith, who is about as far away from Jim Lee at this stage as you can imagine. He isn’t really recognizable as the Paul Smith from the early ‘80s, either, as he’s dropped most of his oversized, bold figures and cartoony expressions. 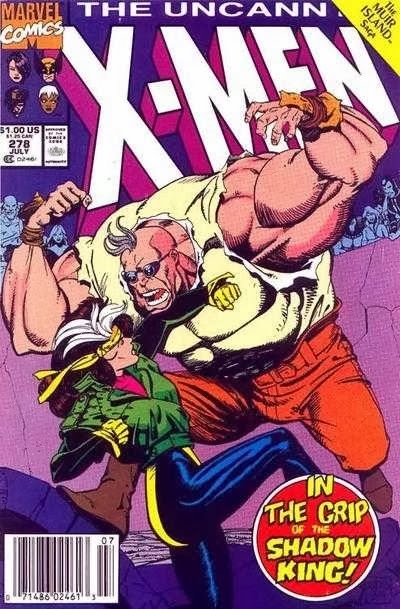 This is a densely packed issue, filled with the large cast of X-Men from this era and the large cast of B-listers relegated to Muir Island, so it’s arguable he simply didn’t have the room to show off this time. Most of the issue consists of six to ten-panel pages, mainly concerned with getting characters to where they need to be and then putting them in a fight scene. There are nice little moments, the ones Claremont can be counted on even during a cramped crossover, such as Banshee and Siryn’s confrontation, or seeing how Xavier responds to someone like Gambit having joined the X-Men in his absence. And it is enjoyable as a fan to see the X-Men actually be proactive for a change and investigate a threat, rather than wait around to be attacked. However, the majority of the issue just feels rushed, which isn't a good sign in the very first chapter in a crossover. Summary: X-Factor investigates the energy release in Edinburgh and is soon attacked by the Proteus/Piecemeal hybrid. 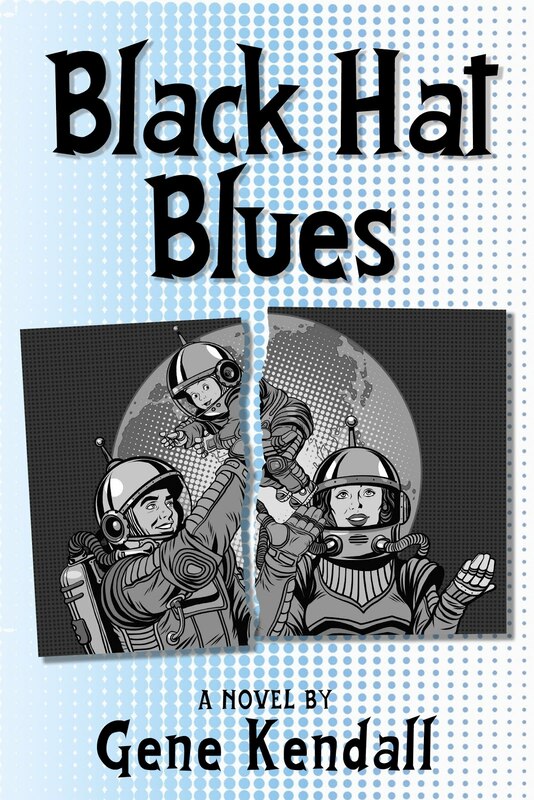 The team is sent to a white void, where they meet the rest of the heroes. Marvel Girl explains Proteus/Piecemeal’s plan to recreate the world to represent mathematical structure and order, inspired by the peace Proteus found during his “death” as he witnessed the patterns created by his energy signature. Cyclops declares that since Proteus/Piecemeal cannot be defeated, the best option is to convince him to commit suicide. Soon, Moira makes this case to Proteus, as Harness continues to verbally abuse Piecemeal. Repulsed by human emotions, Proteus/Piecemeal commits suicide. Later, Harness is placed in custody while Gideon and Toad finish their chess match. 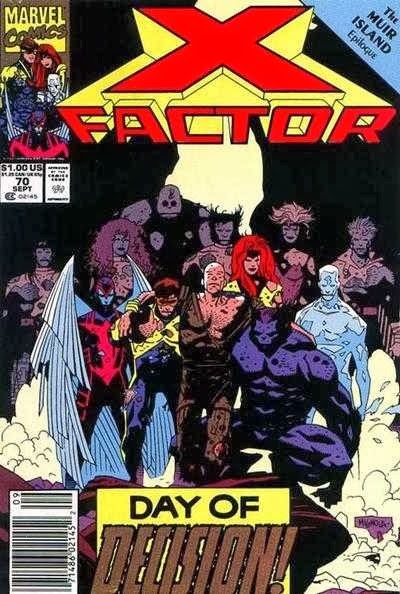 This story marks the first time X-Factor meets the New Warriors. Cyclops, oddly enough, seems to already know the new members of X-Force. Yes, Toad was the mystery chess player throughout the storyline. According to Gideon, AIM and Genetech were manipulated into recreating Proteus. Gideon wanted to weaponize Proteus’ powers, while Toad desired Proteus to join the Brotherhood. Moira identifies Harness as “an AIM assassin,” although I’m not sure how she would know that. At the story’s end, we do discover from faceless AIM higher-ups that Harness has a second mutant child, a seven-year-old girl that they’ll use as leverage if she speaks out against them. Review: So, that’s “Kings of Pain.” And it turns out they were crazy enough to revive Proteus. In all honesty, I can’t say this arc has been terrible; Nicieza has some themes of abuse and neglect to explore, and he’s developed a few ways to use Proteus as more than just a magic prop. And even if there’s no way to really use each member of the massive cast, Nicieza still picks a few characters out and gives them little moments. Cable is humanized for perhaps the first time, as he sides with Marvel Girl against Cyclops’ “Trick the Kids into Suicide” plan. Beast points out that this seems out-of-character, leading Cable to snap that Beast has no idea who he truly is. These brief exchanges are what make Cable tolerable in his early years, and it’s too bad the ongoing X-Force series drops them in favor of shoot-you-in-the-back Cable. The closing, which shows that Moira pushed Proteus away because she knew that the Shadow King would never allow her to truly love him (and, presumably, to prevent Shadow King from possessing someone as powerful as Proteus), is also a smart use of the current status quo. Previously, the ongoing Shadow King plot has been a nuisance that Nicieza had to ignore, but he finds a way to use it quite well this issue. It’s always grating to read a sequel that doesn’t match up to the original, however, and in comparison to the initial Proteus storyline, this simply lacks the heart, innovation, and sheer creepiness of the original. The plot’s needlessly complex, there are characters everywhere and almost none of them contribute to the actual story, and Proteus and Piecemeal are never as sympathetic as I think Nicieza wanted them to be. There’s also the suicide plan, hatched by Cyclops of all people, which could’ve lead to a serious ethical dilemma for the teams, but the debate turns out to be pretty tepid. Plus, the ending hints that there’s a sequel coming…a sequel to a sequel that didn’t need to be told. Please, no. Summary: Pyro and Blob fight back against Desert Sword, while Avalanche rescues Crimson Commando and accompanies him on their helicopter. When Avalanche discovers Pyro killed Dr. Kurtzmann, he orders the helicopter to leave so that Commando can receive medical attention. Realizing they have no options, Pyro and Blob surrender to the remaining members of Desert Sword. Desert Sword member Veil is killed by Pyro, and the Arabian Knight is seriously wounded by Blob. As far as I know, no story has explained how Pyro and Blob escaped Iraqi custody. They soon reappear in X-Force #5. Crimson Commando was supposed to appear next in Erik Larsen’s Spider-Man #18, but was altered at the last moment into “Cyborg X.” At one point, Fabian Nicieza and Erik Larsen pitched a run on X-Factor that included a cybernetic Crimson Commando as a member. Years later, Crimson Commando will reappear as a cyborg, just not Cyborg X, in X-Factor #102.
Review: The end of Freedom Force, paving the way of course for the X-Factor revamp, and the return of Blob and Pyro to the Brotherhood of Evil Mutants. By the standards of annual back-ups, this is rather intense material, and it might even be the earliest example of a team just getting eviscerated during their final battle. As I’ve said before, this serial seemed daring in 1991, and while not all of it holds up, there is a sense of unreality to the story that still appeals to me. Given that most of the Freedom Force cast consisted of horrible people, maybe it’s just fun to see them meet horrible fates. Characters getting mutilated, killed, left for dead…it’s a cheap way to close out a concept now, but I was absolutely enthralled by it at the time. Continuity Notes: Mystique is actually believed dead at this point in continuity, which means this story must predate her “death” in Uncanny X-Men #266.
Review: I wonder how Marvel got away with using copyrighted Beatles lyrics. I know we were a less litigious society twenty-three years ago, but this would seem like something a lawyer would’ve caught even then. Regardless, this is Mystique’s farewell to Destiny, running in the X-Factor annual because…why not? The idea is to contrast Mystique’s perpetual anger over mutant oppression with Destiny’s peaceful view on life, a perspective her precognitive powers give her as she sees the world from a much larger perspective. The major problem with the story is Mystique’s portrayal, since I seem to remember Mystique acting like a fairly well-rounded individual when around Destiny. Destiny didn’t have to go through some elaborate plot to get Mystique to laugh; that seemed to happen naturally (even if her “laugh” might occasionally be an evil cackle). This wouldn’t be the first inconsistent Mystique portrayal, however, and David is able to use Destiny’s powers in some creative ways over the course of just a few pages. As a simple story about two friends (and that's still the official line at this time) saying goodbye, it’s enjoyable.